Instead of using butter, I added grapeseed oil to the celery root cream. In fact, the grapeseed oil was so intense, I used only a spoonful of it and added a somewhat buttery canola oil to the puree as well. Though celery root and grapes are a great pairing already on their own, the red wine aroma of the grapeseed oil further enhanced the connection and created a kind of bond between the two main ingredients. I caramelized the grapes shortly in a hot pan and deglazed it with some dry vermouth. I purposely used grapes with seeds, because they added some crispness to the appetizer. Unfortunately, chewing a few grapeseeds usually create a kind of “dry” mouthfeel. To mask this unpleasant dryness, I fried some cooked and dried quinoa until golden brown. Quinoa, which has been prepared this way, has the exact same crispy texture as grapeseeds (so the guests actually won’t even notice the seeds in the grapes), but without the dry mouthfeel. At last I sprinkled the small glasses with some walnut oil, so that each bite would have a different kind of nutty flavor in the background. Add the quinoa to a fine sieve and pour some boiling hot water over it. Transfer the quinoa to a small pot, cover with hot water, cover and cook until soft. Drain and spread the cooked quinoa on a baking tray lined with parchment paper or a silpat mat. Season with a generous pinch of salt. Dry the quinoa in the oven at 80°C / 175F for 1-2 hours until completely dry. Remove from the oven and break up eventual clumps with your hands. Heat the oil for frying in a small pan. Add the cooked and dried quinoa and fry until golden brown. Drain the oil into a new pan. Drain the quinoa on kitchen paper. Wash the celery root. Peel and trim off large brown spots. Cut into 1cm cubes. Heat the vegetable stock in a pot, add 1 tbsp fennel seeds and put a steaming basket on top. Add the celery cubes on top, season with a generous pinch of salt, cover and steam until the celery is very soft. Transfer the steamed celery root to a new container. Sieve the cooking liquid and reserve. Blend the celery root with 1 tbsp flavorful grapeseed oil, 2-3 tbsp canola oil and add as much reserved cooking liquid to get a smooth and fine puree. Season with 2 drops chili oil and salt. Strain the puree through a fine sieve. Keep warm or refrigerate and reheat over low heat stirring constantly. Just before serving the dish, heat a small pan until very hoz. Wash the grapes and cut the larger ones in half. Add the halved grapes with their cut side down to the hot pan and allow to caramelize for a few moments. Add the whole grapes and toss the pan to loosen the halved grapes. Add the vermouth and season with a pinch of salt. Reduce the liquid slightly, then remove the pan from the heat. If you have a siphon bottle, transfer the creamy celery root puree to the siphon, charge with 1 (N2O) cartridge and shake vigorously. 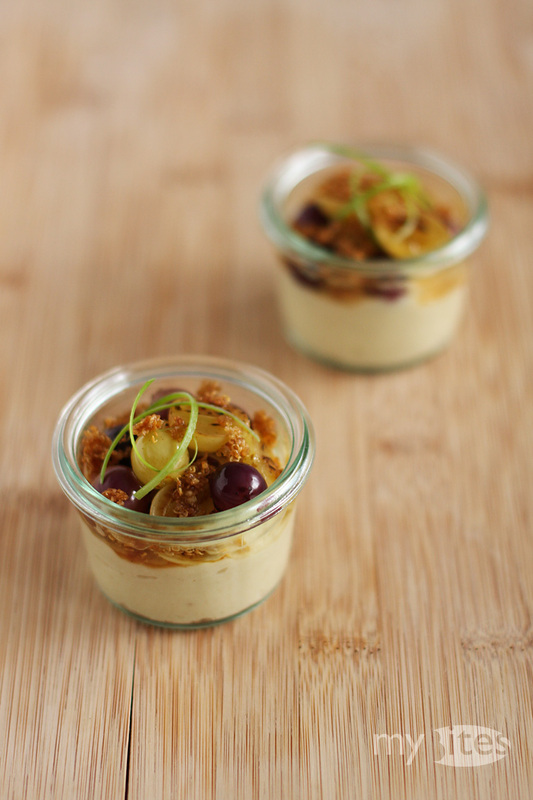 Put about 3-4 tbsp celery cream in small warm glasses, add the grapes on top and sprinkle with crispy quinoa. Decorate with a few thin strips scallion greens and sprinkle with about 1 tbsp walnut oil. You have inspired me in a lot of different ways. One of them is to use exclusively local fish, especially trout (“Schwarzauer Bergforelle”, originating where are first class Viennese tap water comes from….) in the future – starting with my next menu dedicated to France. This is why I browsed and studied a lot of your recipes yesterday. I will let you know what this will lead to ;-)! And you have made me curious as for buckwheat and quinoa – I will have to try out these ingredients which are entirely new to me out, soon-to-be! I have never ever used grapeseed oil… have to buy one :). Thank you! Well, as explained in the post, there are huge differences among grapeseed oils. Neutral grapeseed oils tend to have no color at all, while flavorful grapeseed oils are green or even dark green. Another good indicator is the scent of the oil. Probably, you’ll have to look for flavorful grapeseed oils in special deli shops.